Angelica is a tall, elegant Accoyo female we bred out of our 6Peruvian Accoyo Estrella and Kilyo of Star Hill. Kilyo had unusual fineness, brightness and strong, bold wave crimp/lock style that was eye-popping. We tried to purchase Kilyo as auction several years ago but a large breeder also had their eyes on him and out bid us going for over $60,000. Angelica continues to produce outstanding cria for our program every year. Accoyo Augustine is one of the first full Accoyo offspring of El Nino's Accoyo Michelangelo. 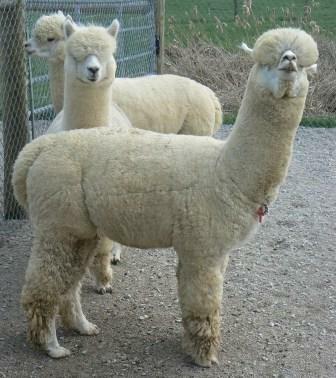 Augustine is a strongly-built white stud with a dense and tight topnot, extreme density, and a fine, uniform fleece. His dam, Accoyo Angelica, is equally impressive. She is a large, white female with the best combination of fineness and density of any female on our farm. Her dam, Estrella, is also the dam of Accoyo Brutus, one of our former top Accoyo studs. "Augie" is large-boned with an extreme topknot that we have to trim around his eyes. 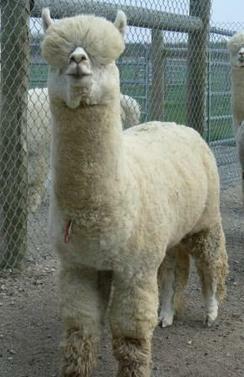 As a cria, he had deep wrinkles going up his neck which some breeders associate with density. 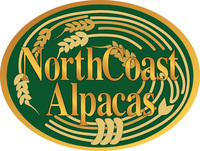 We have many of Augie's cria on the ground for you to see with more on the way. Watch for them in the show ring!